It was spring 1954. Sylvette was just 19 and living near the sea in the south of France. 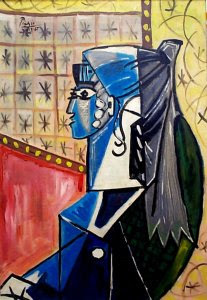 Her next-door neighbour was Pablo Picasso, the 20th century’s most famous and influential artist. She had no idea he had even noticed her. But one day, as she was walking in the garden, she heard a rustling sound and a painting slowly arose above the garden wall. Girl with a Ponytail, one of the many studies Picasso was to make of her, was to become one of his most famous paintings. And now, more than half a century later, Lydia Corbett (she changed her first name to Lydia when she came to live in England in 1968) is about to open an exhibition of paintings of her own. Sitting in her home in Devon, she recalls the extraordinary three months of her life when she was Picasso’s muse. Still attractive at 72, it is not hard to see why Picasso was drawn to her. He had done that very first drawing of Corbett from memory after spotting her in the village of Vallauris. “I had no idea he was doing it,” she recalls in her softly spoken voice with more than a hint still of a French accent. She wore her hair in a ponytail because her father suggested she should put it up that way. Her sittings led to 40 different paintings and several sculptures. In all of them it is that ponytail which is the iconic leitmotif. She had no idea how fascinating Picasso obviously found her. Nor did Corbett quite appreciate that she was, as she now puts it, “in the middle of two other women”. 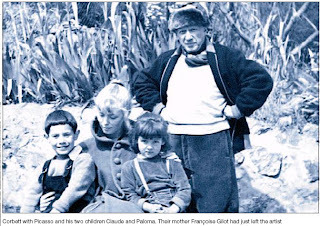 Picasso was at the time splitting from his long-term lover Françoise Gilot, the mother of his two children, Paloma and Claude. Gilot had left the house, though the young children were often there with their father. Corbett still has a photo of herself holding the two youngsters with Picasso, wearing a rather incongruous fur hat, standing behind her. Picasso was just about to become romantically involved with Jacqueline Roque, who, after he finally broke with Gilot, became his lover and wife for the final 20 years of his life. Within a month journalists had got to hear about Picasso’s new muse. Paris Match, then a hugely influential magazine, ran a story with photographs of Corbett that were noticed by two other near neighbours — the film director Roger Vadim and his girlfriend Brigitte Bardot. 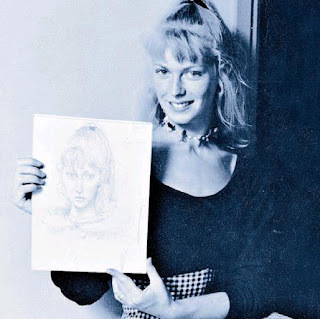 “Bardot came with Vadim to visit Picasso,” recalls Corbett. “She really wanted to be painted by him but Picasso refused, saying he would only have one model at a time.” Corbett smiles. Bardot might have later gained worldwide fame, but Corbett was the one who was painted by Picasso while he turned down Bardot. Yet Corbett can claim to have helped Bardot’s film career. “She had dark hair when I first saw her at Picasso’s place. I learnt that Vadim admired the colour of my hair. So he got Bardot to change hers to blonde.” The rest, as they say, is history. Nonetheless Corbett now thinks Picasso, while obviously attracted to her, might also have been using her to make Gilot jealous. He was very hurt that she had left him. In fact Gilot later wrote in a memoir that she believed Picasso was using Corbett to woo her back. After a few weeks of sitting, Picasso suggested that he should pay her. “That’s when I suspected that he might want me to take my clothes off, though he never actually asked.” In fact towards the end of the summer Picasso did show Corbett a picture of a young naked girl. “It was not me as such, but he did say it was inspired by me,” she adds. The sittings came to an end soon after. Picasso had begun a serious relationship with Roque and moved homes, while Corbett remained in the village with her mother. Corbett, whose exhibition of watercolours opens in Exeter this week, will always remember the spring of 1954 with great affection and gratitude. “I could have fallen in love with Picasso if I had let myself. But to be honest he was too old.” He was 72 then — the same age Corbett is now.